Dashing Heroes of More Civilised Times! 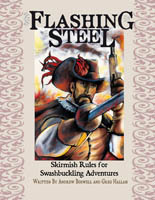 Flashing Steel is a fast paced, skirmish level, romantic Late Renaissance, miniature war-game system for two or more players. Based on the popular Song of Blades and Heroes mechanics, the rules are simple to learn but laden with lots of crunchy tweaks. This is both a war-game and a chance to do a little story-telling about your army. 1560 to, say, the early 1700's: the Age of Exploration. Religious wars tear Europe apart. Families are split by the English Civil War. The Dutch break away from Spain after a titanic 80 year struggle. Spain attempts and fails to invade England in the largest naval operation to that date. The seas are opened to suicidally brave mariners who bring back the wealth from the New World, and who are in turn harried by Privateers from every other nation. The Turks knock on the borders of the Holy Roman Empire. Sweden grows to be one of the First Nations, and then recedes again. Transylvanians sweep down from their forests. And Shakespeare writes about it all. Save the Queen from the machinations of the only man who really has a plan for the kingdom; resist the the spread of poisonous Protestantism; scheme with the revolutionaries to assassinate the Prince; board the enemy vessel and take what is not yours by right. And through it all, do it with style: in well dressed simplicity, an easy smile and a cutting remark, and murderous slash with your sword that leaves enemies cowed and ladies fanning themselves. Do you have what it takes to survive during the Peak of European Civilisation? Fast Play: Finish a battle in 30-45 minutes; play a mini campaign in a single evening. Campaign generator: use the scenario generator to create a linked series of adventures that build a full story arc. Multi-scale: easy conversion table so you can use your 15mm, 28m or 54mm single based figures. Easy entrance: your army can be as few as 4 models. The system will accommodate up to 15. Small play area: since the scale is single man skirmish, a 3'x3' or even down to a 2'x2' table is all you need. Pregenerated statistics: full historical sections of pirates included, along with their statistics. That's 31 historical pirates, laid out for you to pick up and play. Sample campaign fully described. Note: this is a complete, stand alone product. Purchase of Song of Blades and Heroes is not necessary. Cheung Kar Fai 10 10 10 Excellent game with a handful figures and small playing area; highly recommended.